Nothing says home more than a custom recipe box and cards from Pinhole Press. The kitchen is the heart of our homes and family as well as our stomachs. It's where old traditions take place and new traditions built. It's also where recipes have been passed down through generations and new recipes shine. 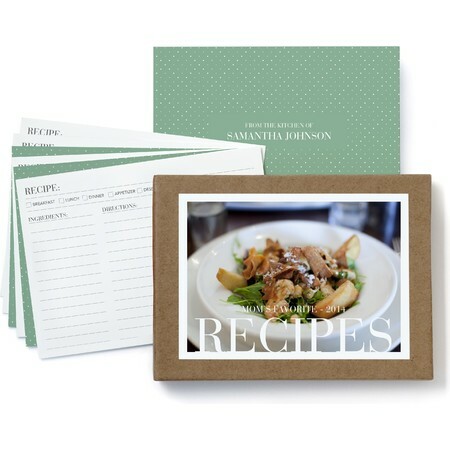 Document your family's favorite dishes with a homey boxed set of personalized recipe box and cards. Record old family favorites and new recipe discoveries to add to the box. 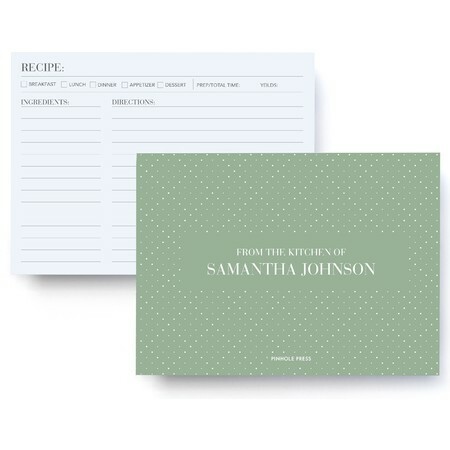 These darling recipe cards are personalized with your name on the back of each card. Cards are printed on ultra white premium paper made to stand the test of time. Select a color that fits your kitchen's decor and create your very own recipe box and cards to cherish now and for generations to come. The set of 50 cards fits snugly into a recipe card box personalized with your favorite photo. It's the perfect gift for the chef in your life - which very well maybe you!